Yesterday, I couldn't get to the studio, so I did some prep work on the computer in the form of digital overlays to try to resolve the likeness. The result was not successful visually (see yesterday's post), but the effort was helpful conceptually nonetheless. This morning, I printed out the photo of this portrait as of the last painting session, made just a few marks on it with a pen, and headed for the studio knowing exactly what I needed to do. As I left the house, I announced to anyone who would listen that I was only going to make five marks on the canvas. When I got to the studio, I really did limit myself to the handful of small changes I had decided upon: I modified the arch of both eyebrows, raised one eyebrow a bit, and re-drew the eye shape. Then I added a shadow to the bridge of the nose. And that was it. I had the expression I wanted. 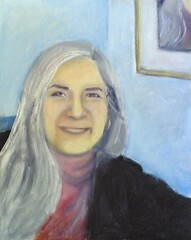 The smile in the portrait is more relaxed than in the reference photo, so it looks different. But I can recognize myself in the portrait, so I am happier with the likeness. I decided to stop there and not do anything else to the face today, apart from adding a little pink to the skin tones. Instead, I worked on the background, just trying to clean it up and make it neat. I also made a few small changes in the picture within the frame on the wall behind me, which is also the self-portrait, or a corner of it. Right now I am happy with the painting, but as always I know it is likely that I will see things I want to change. But for now, I am going to let it be. I am going to take time to decide whether to add more detail to give the painting a more polished look, or leave it as it is. Something about the unfinished look of this painting appeals to me; and it is a good reminder that this self-portrait is still a work in progress, as is the artist who painted it. Great! I like the composition, too!